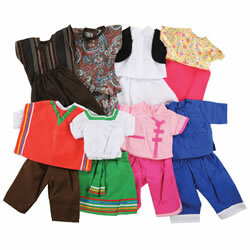 Add life to a child's favorite doll through fashionable clothes, strollers, cots, and accessories. 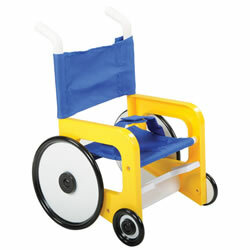 Kaplan also includes accessories such as wheelchairs, leg braces, and a seeing-eye dog to build understanding and acceptance towards special needs students. 3 years & up. Doll clothes for our Lots to Love Babies and dolls that measure between 10 to 13 inches. Detailed clothes with hook-loop closures. Includes 4 outfits. Fabric may vary. Please note: we strive to bring great quality and fit, however, dolls vary in style and shape, these clothes may not fit all 10"-13" dolls. 2 years & up. Perfect size doll clothes for dolls that measure 10 to 13 inches. Detailed clothes with hook and loop fasteners. Includes 4 outfits. Fabrics may vary. Please note: we strive to bring great quality and fit, however, dolls vary in style and shape, these clothes may not fit all 10"-13" dolls. 2 years & up. 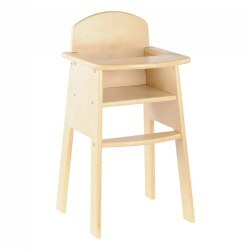 This wooden doll high chair features a clean modern design, ample space for baby doll to sit, a foot rest, and plastic capped feet to give it a finished look. Fully assembled. Measures 24"H x 11 3/4"W. Doll sold separately. 3 years & up. 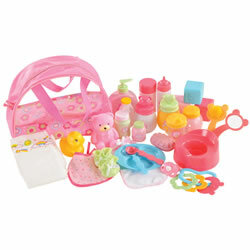 Everything your little one needs to care for her baby doll. 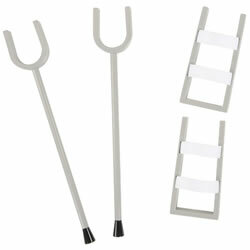 This 29 piece set comes in a reusable zippered case with handle that measures 8" x 6" x 6". 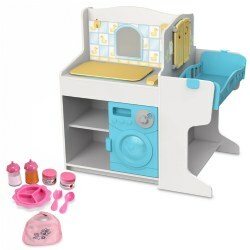 Set includes baby necessities such as bottles, diapers, baby wipes, dispenser, bottle warmer, and training potty. 3 years & up. Get your dolls ready for a walk in the park, a visit to grandma's, or a cozy night's sleep. Machine washable. Fabrics and colors may vary. Please note: we strive to bring great quality and fit, however, dolls vary in style and shape, these clothes may not fit all 13"-16" dolls. 3 years & up. Dress dolls up for a cozy night's sleep with this comfy set of 4 outfits. Fits dolls 13"-16". Machine washable. Fabrics or colors may vary. Please note: we strive to bring great quality and fit, however, dolls vary in style and shape, these clothes may not fit all 13"-16" dolls. 3 years & up. Dress your dolls like children from around the world. 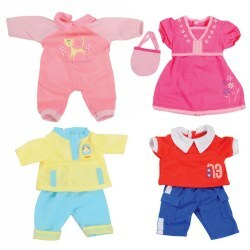 Includes boy and girl outfits from China, India, Europe and Africa. Fits most dolls 16" - 18". Fabrics may vary. Please note: we strive to bring great quality and fit, however, dolls vary in style and shape, these clothes may not fit all 16"-18" dolls. 3 years & up. Build self-esteem and an understanding of special needs in students of all abilities. Equipment fits 16" Dolls. Doll not included. 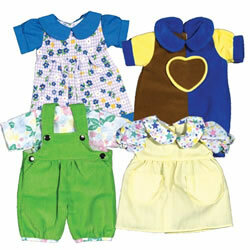 There is lots to love about these adorable one piece outfits. 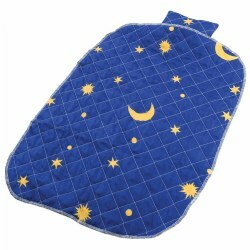 This set of four comes with its own receiving blanket so you can swaddle your baby in comfort. Doll sold separately. 3 years & up. Dress dolls in fashionable designs just like you! Includes outfits for boys and girls. Machine washable. 10 piece set. Please note: we strive to bring great quality and fit, however, dolls vary in style and shape, these clothes may not fit all 16" dolls. 2 years & up. Dolls sleep comfortably on our cots! Made of durable, high-quality materials, just like our child-sized K System® cots! Minor assembly required. 5"H x 22"W x 14"D. Doll not included. 3 years & up. 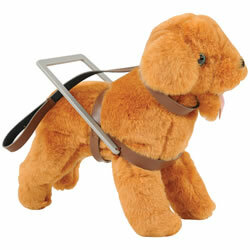 Build self-esteem and an understanding of special needs in students of all abilities with this cane and seeing eye dog set. Equipment fits 16" Dolls. Doll not included. 2 years & up. 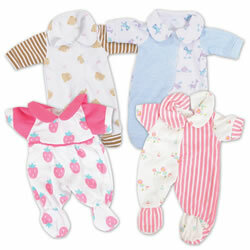 Dress your baby in these soft, comfy and washable doll clothes. Set includes hats, booties and 3 outfits. 3 years & up. Build self-esteem and an understanding of special needs in students of all abilities with this leg brace and crutches set. Equipment fits 16" Dolls. Doll not included. 3 years & up. Dress up your dolls in today's fashions with these stylish ensembles that feature embroidered details, washable fabrics, and easy-on and off hook and loop closures. Please note: we strive to bring great quality and fit, however, dolls vary in style and shape, these clothes may not fit all 13" dolls. Make a soft spot of dolls to lay their heads with this matching quilt and pillow set. Fabric may vary. Pillow: 4 1/4"W x 6 1/2"L. Quilt: 16 1/2"W x 23"L.
3 years & up. Dress up your dolls in these stylish pajamas that feature embroidered details, washable fabrics, and easy-on and off hook and loop closures. Please note: we strive to bring great quality and fit, however, dolls vary in style and shape, these clothes may not fit all 13" dolls. 3 years & up. 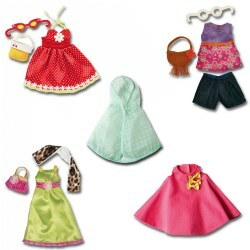 Prepare your Groovy Girls® dolls for all different kinds of social events with these fun fashions! Whether it's a casual day out or a glamorous night on the town, your girls will be ready to go. Buy the sets individually or the complete set of six fashions. Fits 13" Groovy Girls® soft-bodied doll. Dolls are not included. 3 years & up. 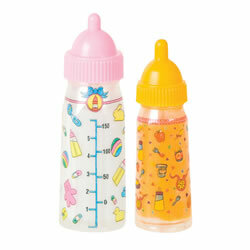 Feed the baby doll with these pretend play baby bottles! Bottles drain and refill with liquid just like magic! Each package includes: 1 Magic Milk Bottle and 1 Magic Juice Bottle. Each bottle measure 4.75". 18 months & up. 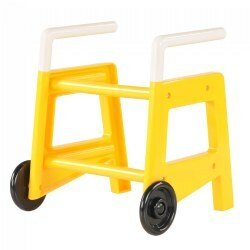 Toddlers will love taking their baby for a walk with this stroller sized just for them. Fits baby dolls up to 12". Measures 21"H x 10"W" x 13"D. Doll sold separately. Fabric may vary.